This is the fourth installment in our series of articles on hidden or obscure strategies for improving musicianship. Obviously, spending time playing your instrument is extremely important in developing your talent. However, these articles explore some of the subtler more psychological angles to gain musical advantage. Sometimes you have to trick your mind or body into acquiring the behaviors you need in order to reach the musical goals you want. So here is Tip Four. It's all about time. You need to find the Golden Time. You need to carve out that little segment for your piano playing each day, and make it a sacred priority. Here's the trap. You decide to pick up a new hobby, learning piano or whatever. So making time for this new activity is something new to add to your already busy schedule. You don't have a busy schedule? Yes you do. Everybody has one. So now you've got to squeeze an extra 45 minutes into your daily routine. So what do you do? You tell yourself, OK after the day is over, after the chores are done, the dishes are washed, the kids are in bed, hey that's going to be my ME time. And I'm going to spend my ME time practicing the piano. Doesn't work. When day is done, your body is programmed to go into shut-down mode. Your brain is starting to disengage. Resistance is futile. That's not the time, not if you have a busy day schedule for tomorrow. You need to find a special, specific time to do the ME time. And then make it your priority. So when is that going to be? That's the challenge isn't it? The answer will vary, depending in part on how dedicated you are. We've heard about would-be authors who decide to write a book, so they set their alarm clock for 4 am instead of 6. And they spend those two hours every morning writing their manuscript. The rest of the day is as usual. Work, family, social, etc. But they carve out their writing niche. And two years later their novel is done. You want to play piano on cruise ships in two years? That's one way to do it. Set that alarm clock. (How counter intuitive for a musician)! I look back on the early days of my piano studies and I see how powerful this time management stuff can be. I've told the story repeatedly about how I got hooked on playing the piano when I was 23. And I started taking lessons then. The part of the story that you may not know is that at the time I started these piano lessons, I didn't even own a piano. I was working full time as a clerk in a camera store in East Oakland and lived in a little one room hovel that was attached to a garage. We're talking tiny. And I had no piano to play. But I was paying for weekly lessons, and I was determined to succeed. So for the first six months, every day, six days a week, I drove to my parents' house just to do my 45 minutes of practicing. It was a perfect situation. I got to use a piano, they got some attention from me, I got dinner every night and a chance to do my laundry once a week. And the money I saved on meals and laundry helped pay for my piano lessons. And I was saving up to buy a piano of my own some day. The point is I had to make a concerted effort EVERY DAY to drive the five miles to the parents' house just to make my piano commitment. After a few months I knew my passion was real, and I saved up $85 and bought my first piano at a yard sale. But the pattern was established, and that 45 minutes a day became sacred to me. Can you find your time? Even if it's just 15 minutes a day, that's enough to get yourself into a pattern, which then becomes a habit, which then becomes a routine, which then becomes your desired behavior. Playing piano. Here's a couple of very short true life stories. I retired from "show biz" a long time ago. But I still like to play music, of course, and I like to play with other people, which sometimes results in playing out in public. Last night my little band had one of our gigs at a local restaurant. This is a real specialty band. We play exclusively Brazilian tunes that were written like between 1920 and 1960. It's not samba, it's not bossa nova. It's a precursor to those styles. The style is called choro. Pretty obscure stuff. The music is all written out, kind of like classical music, except with chords too. I prefer to memorize the music. I have more fun if I don't have to worry about following along in sheet music. But the chord changes are really hard to learn. There are so many of them. But there is a tool I depend on for memorizing these songs. It makes things easy. Same location, the local restaurant, same time, same characters. Pam, my spouse, plays in this band too. Clarinet. She's good. 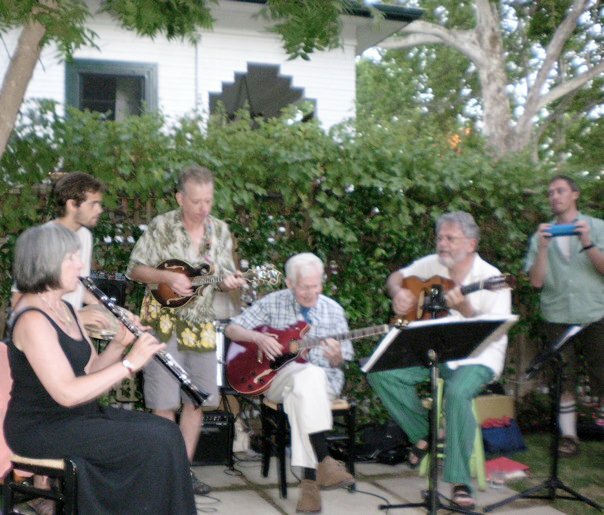 In between our regular choro sets, we had a special guest join us o the band stand, Pam's father. He's going to be 92 on Monday, and he still plays guitar every day. We got Buck to join us for a few songs. He came up, 92 years old, plugged in his electric guitar, and wailed away. Pam and I accompanied him, and one of the songs he chose to do was a song I had heard of, but had never played before. And I had no music. Yet I was able to play the chords as if I had the music right in front of me. There was a tool I used that enabled me to do that. Same tool. What was the tool? It was the Circle of Fifths. The trick is in knowing how to use it. Anyway I couldn't wait to write out these stories, and send them to you. Click below to find out more about this tool, and to order my special presentation for less than ten bucks, no strings attached. It's true a large part of mastering pop piano is getting over the hurdle of learning chords. With 12,000 chords (or more) to deal with, which ones are essential, and which ones can wait? I already addressed part of that question in my previous comment. Learn the 12 majors, 12 minors, and 12 sevenths. That prepares you to play any song as long as you have the Chord Simplification Flow Chart that is in the back of the book you get when you take my Instant Piano three hour workshop. Then I suggested learning the 12 basic chords that lend themselves best to the key of C. You can find those in my previous post as well as in my book How to Play Piano by Ear. Here's another strategy. Learn new chords as you learn new songs. Make a list of songs you want to have in your repertoire. Then make a pact with yourself to learn one new song a week. Go through each song and make a list of the chords you don't know from that song. Then do the research and learn the chords. Play the chords with the left hand in the order they appear in the song. Chords may be difficult by themselves. But learning to change from chord to chord is even more demanding. So do this exercise for 15 minutes a day, and you will probably be able to keep up with your one-song-per-week goal. As for the question of playing everything in the key of C. That might work as a short term strategy. But don't jump to the conclusion that C is the most important key. It isn't. But it's the easiest. And that makes it easy to fall into a "key-of-C" bias. Not good. The Master List of 12 important chords (The Top Twelve List) I listed in a previous comment only works for the key of C, by the way. But in the course I teach how to transpose that list into other keys. As I was learning piano I played almost exclusively in the key of C for the first five years. Nothing to be proud of. But I got good. In the key of C. Then I joined a band. The guitar player liked to play everything in the keys of E and A. I was pretty lost for awhile. Once again, if you learn one new song a week, and you don't just choose them because they are in the key of C, then you will learn to play in all the important keys pretty fast too. Hayden, you mentioned the Study Guide being only available to those who have the 18 month course. The fact is anyone can download that from our web site for free. http://pianofun.com/catalog/detail_HSC.html. But it doesn't help too much unless you also have the course (unless you just are curious about what you learn in the course.) Go ahead and download it if you want. Now here is the best way I know of learning the basic chords, because it helps you with not just the chords themselves, but with changing the chords, AND in recognizing the most common chord progressions in life. It's called the Circle of Fifths. Or the Circle of Fourths. Same thing. If you've taken my "Piano by Ear" workshop you have that chapter in the book. And more importantly you have the CD called "Circle of Fourths Practice." If you have that, and you have gone through it, I'd love to hear your comments about it here on this blog. If you have it, but haven't gotten around to it yet, maybe now is the time. If you don't have it........ Hummm. Let me think about that for awhile. Play on, and thanks for the interaction. Tip Four is coming up soon.